Look out here comes the new baby Spiderman generation! The Spiderman theme never went out of style for comic book collectors and enthusiasts. With the Spiderman 3 movie, here’s an opportunity for Spidey to spin his web and win the affection of babies all over the world! Gather your baby Spiderman bedding, removable wall stickers and decals to create a personalized wall mural, your treasured movie memorabilia and some framed Spiderman posters. With a combination of those items you can pull together a complete Spiderman bedroom theme that kids from the crib on up to the college dorm room will love. With the success of the recent Spiderman III movie you will have no trouble finding licensed products for your project. The product lines have even expanded to baby items decorated with Spiderman motifs. Choose from from lampshades and wallpapers to stickers and wallpaper borders covered with spider webs and other brightly colored pictures of your favorite red and blue super hero. Be bold and have fun creating your Spiderman decor. Use the large space as a blank canvas for your baby Spiderman nursery theme. The best Spiderman wall paint colors would be a neutral off white or beige so that the colors of his costume will really pop. If you dare to try a more detailed painting technique, paint a spider web on the nursery wall in black. If you don't feel up to the task of such a challenging wall painting technique, take a trip to the themed party accessory store and pick up some stretchy spiderwebs that you can attach at various points in your Spiderman theme that will make a wonderful 3-D display. No baby Spiderman theme would be complete without Spiderman spinning a sticky web somewhere in the kids bedroom. 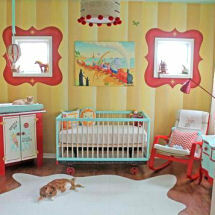 Another way to work in the Spiderman theme is on the floor of the nursery with a woven spider web nursery rug. A rug that worked as a spooky Halloween costume accessory will work nicely to carry our baby Spiderman theme to the nursery floor. As there will probably be lots of color in the red and blue Spiderman graphics elsewhere in the room, a black rug with a white print web will be just fine. Speaking of Spiderman images, daddy might have some collectible baby Spiderman toys or comics that he will allow you to borrow for baby nursery wall decorations. So long as there is protective glass and acid-free museum mounting no harm should come to his precious funny books. If your kids don't have a super-hero collection of comic books or posters to draw from, pick up some Spiderman stickers, decals or wallpaper cutouts and make your own display. Large Spiderman wall decals would work with your color scheme and make the room really pop with the comic book hero. You may be able to use some of the printable Spiderman stickers free of charge that you can download from the net. The modern thing to do is to get Spiderman 3 computer wallpapers and use your desktop computer to provide part of the nursery décor with fabulous 3-D animated digital artwork. You can get free Spiderman movie wallpapers from lots of websites free of charge. A nursery mural of Spiderman scaling some skyscrapers painted on your baby boy's nursery wall to go with the Spiderman spinning the web bedding would be fabulous if you are artistic and handy with paint and brushes. If you can find a cheap Spiderman movie poster that's not valuable you might make your own baby Spiderman decorations and cutouts. Hang the graphics strategically on your spider web painting or skyline mural. If you're afraid that your baby Spiderman nursery crib bedding, and decorating ideas will go out of style before you are ready to give the room a makeover or that your boy won't care for a Spiderman theme when he is older, use solid color bedding so that when you want to update the look all that you will have to do is pack up the Spiderman stuff and change out the accessories. You could get years of use out of a set of solid red or royal blue baby bedding as these colors will adapt to many popular baby boy's bedroom themes. A Spiderman theme room would work with most any color nursery furniture that the Spiderman stuff for kids would really pop against a black baby crib. Here's where you could really save some money in your Spiderman bedroom decor! Get a used or discontinued crib and paint it yourself with glossy black enamel paint. Royal blue, black and red Spiderman colors carried throughout the room are going to look like a professional decorator came in to layout your Spiderman room decor. Please visit Unique Baby Gear Ideas often to find more Spiderman baby nursery decorations and the latest in super hero bedding sets for your kids' bedroom.